After the drive from the fantastic, mind-blowing (in a humble, Buddhist way) ceremony, you’ll probably want a drink. 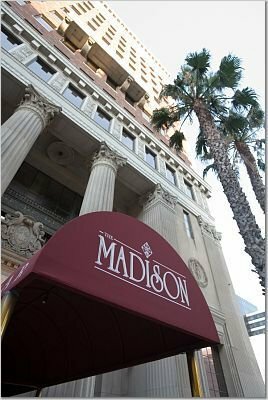 We’ll have them for you at The Madison Restaurant, a beautiful art deco restaurant (built as a bank in 1916) in downtown Long Beach. Cocktail hour starts at 5:00 PM. We’ll have an open beer, wine, and non-alcoholic drink bar throughout the night, but it will close for an hour or so during dinner, so be sure to visit early and often. The reception will run until 11:00 PM, at whch point you’ll still find plenty do do in the neighborhood if you still feel like kicking up your heels. We strongly encourage staying at a local hotel. It’s convenient, there are lots of different price ranges available in the neighborhood, and we’d rather not have to remember our wedding day as the day someone drove after a few too many. Finally, a word about kids. If your children are our nieces, nephews, or cousins (go, Uncle Ray! ), please bring them. If not, please make other arrangements. There’s a lot of travel and a very long day involved, so the kids will be happier, and you’ll be able to get that lampshade on your head with less guilt.